I hadn't visited the National Zoo in a while, and I was missing the animals. So with the weather cooling down, I returned to the zoo finally today. Similarly to my last jaunt to the zoo, the animals in many exhibits I passed were either nowhere to be found or lazing about in a stupor. But patience and persistence are virtues for the photographer. It's a trope that big cats are just that, larger versions of the frequently lazy but sporadically rambunctious creatures the Internet worships as minor deities. 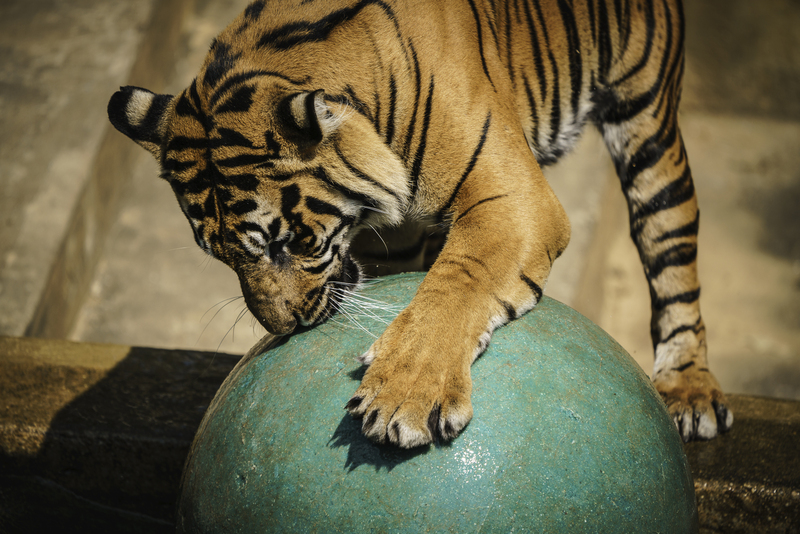 The tiger I saw today got in touch with his inner kitty, clambering around his enclosure and playing with huge balls that were floating in the moat. He was a joy to watch! Big cats are so cute that I have to remind myself of the very good reason why a fence atop a huge concrete embankment, and then a moat, separate me from them. As for my gear, I was excited to try out my latest acquisition, the new Sony 100-400 FE GM telephoto lens. Sony has understandably required time to craft a robust lens ecosystem for their pioneering mirrorless camera format, and I was eagerly anticipating something like the 100-400 for animal photography. I bought the 70-300 last year to hold me over, not knowing when Sony might roll out the telephoto lens I really wanted. But after the 100-400 GM debuted, I traded in the 70-300 lens when I got the chance. And I was happy the 100-400 was on my A7R II today. It reaches appreciably further than the 70-300, it autofocuses with greater speed and reliability, and it has greater sharpness (although that's certainly helped by not needing to crop for range, letting me take full advantage of the A7R II's resolution).